Everything and everywhere closes in Greece on Easter Day, it seems. Strolling through Thessaloniki yesterday, even the periptera or corner kiosks close, including the ones that claim they stay open 24 hours a day and 365 days a year. But it’s not just the kiosks, the cafés and the army that take a break on Easter Day – even the churches close from mid-day, having had a busy and hectic schedule for the previous eight days or more. 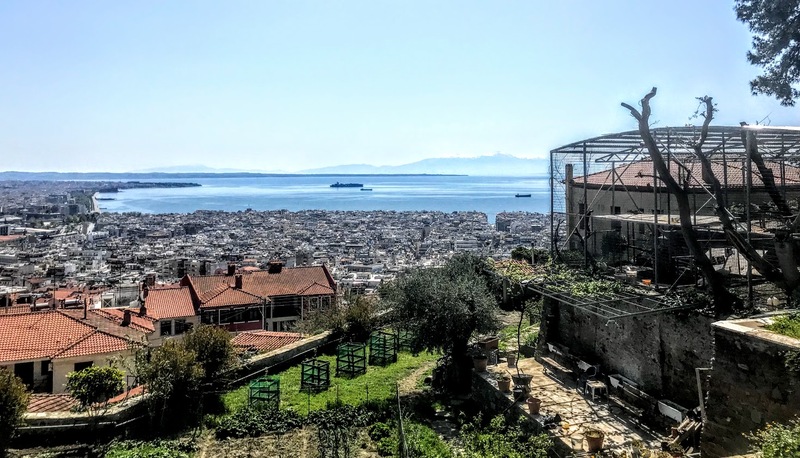 Late on Sunday morning, after strolling along the seafront and through the streets of Thessaloniki, two of us climbed up to the old town, and spent a few quiet hours in the Monastery of Vlatadon which is perched like a balcony above the city and the harbour. Vlatadon is next to the imposing Byzantine Portara or Great Gate in the old town and is one of the oldest and most important Byzantine places in Thessaloniki. Tradition says this where the Apostle Paul preached in Thessaloniki during his second missionary journey in the year 51, and recent restoration work on the katholikon or main church has revealed wall paintings that date from the 11th century. 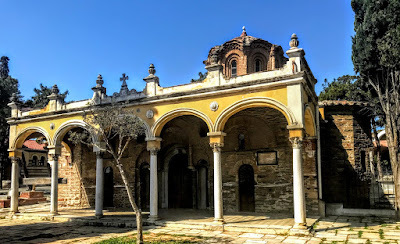 The Monastery of the Vlatades, also Moni Vlatadon, is a Holy Royal Patriarchal Stavropegic Monastery that answers directly to Patriarch of Constantinople rather than the Church of Greece. It was founded between 1351 to 1371 by the Empress Anna Palaeologus and was named after two monks from Crete, Dorotheos and Markos Vlattis, two of the closest friends of Saint Gregory Palamas, Archibishop of Thessaloniki. These two brothers travelled with Saint Gregory to Constantinople in 1341, when he was called before the synod called to deal with the hesychast controversy and Saint Gregory’s theological differences with Barlaam of Calabria. The monk Dorotheos returned with Saint Gregory to Thessaloniki and took up permanent residence in the city. He later became Archbishop of Thessaloniki from 1371 to 1379. 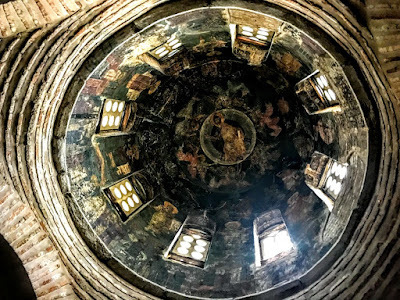 His brother Markos travelled to Mount Athos, where he lived as a monk at the Great Lavra, but he too returned to Thessaloniki in 1351, when the brothers founded the Monastery of the Pantocrator at Vlatadon in 1351. Among their benefactors was the Empress Anna Palaeologos, the widow of the Emperor Andronikos III. She had retired to Thessaloniki and she gave the monastery its royal status. The monastery was given patriarchal and stavropegic status by Patriarch Neilus Kerameus in the 1380s, and it was later dedicated to the Transfiguration. Thessaloniki and the monastery were occupied for the first time by the Ottoman Turks in 1387. While the monastic community remained together, the monastery properties were sequestrated as royal property, the main church was converted into a mosque, its frescoes were plastered over, and a unit of Turkish troops was billeted at the monastery. The Turks left Thessaloniki in 1403, and Vlatadon resumed its life as a monastery once again. When the Turks returned and occupied Thessaloniki a second time in 1430, the monastery was not confiscated and monastic life continued. 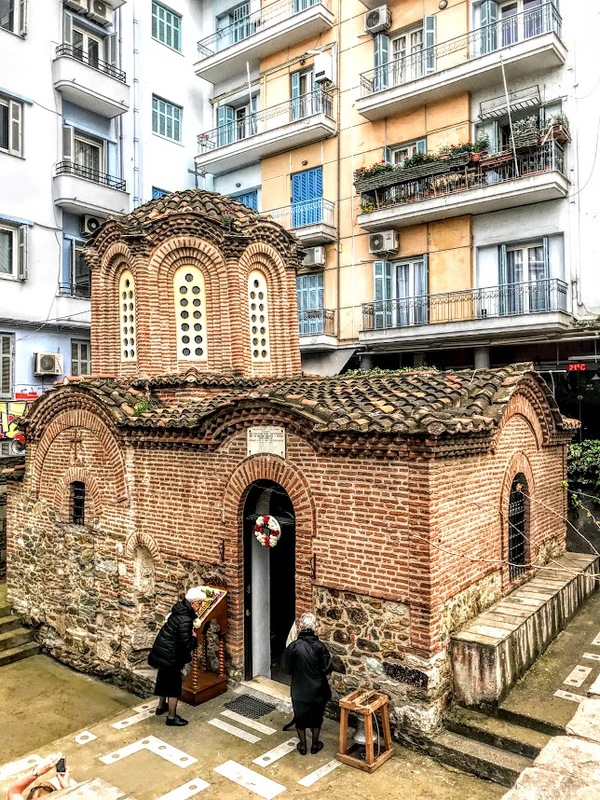 When the Church of Aghia Sophia in Thessaloniki was turned into a mosque, the relics of Saint Gregory Palamas were moved to Vlatadon for safekeeping. But Vlatadon went through a decline in the late 16th century throughout much of the 17th century. Despite the support of a succession of Patriarchs of Constantinople, the monks of Vlatadon failed in their attempts to recover their dependencies in Thessaloniki, and in the early 17th century, Vlatadon was a dependency of the Monastery of Ivrion on Mount Athos for 15 years. Abbots Ignatios Konstantinou, who was abbot from 1755 to 1814, worked on restoring the monastery, and renovated the katholikon or main church and other buildings. But the monks often failed to run the monastery properly in the 19th century, and the Ecumenical Patriarch was forced to appoint lay wardens before restoring the office of abbot in 1866. When Kallinikos Theologides was abbot from 1871 to 1892, the Patriarchate transferred the income from the land holdings of the monastery to the Theological School in Halki, and Vlatadon experienced a new period of poverty. Abbot Kallinikos Georgiades, who was abbot from 1892 to 1923, began to repair the decaying building complex, and serious renovations began when the political atmosphere changed with the liberation of Thessaloniki in 1912, and its incorporation into the modern Greek state. Abbot Ioakeim of Iviron (1923-1940) began a building programme that included a new abbot’s residence, a sacristy, a chapel dedicated to the Mother of God, and other new buildings. 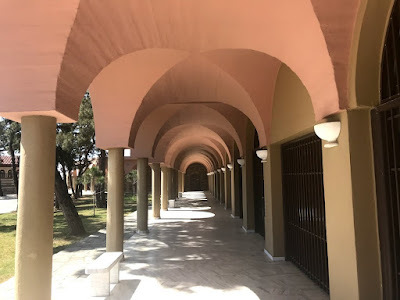 But the monastery faced a new financial crisis when its lands in Kalamaria which taken to house Greek refugees deported from Turkey in the 1920s. By the mid-20th century, Vlatadon had developed a reputation as a meeting place for scholars and academics in Thessaloniki. 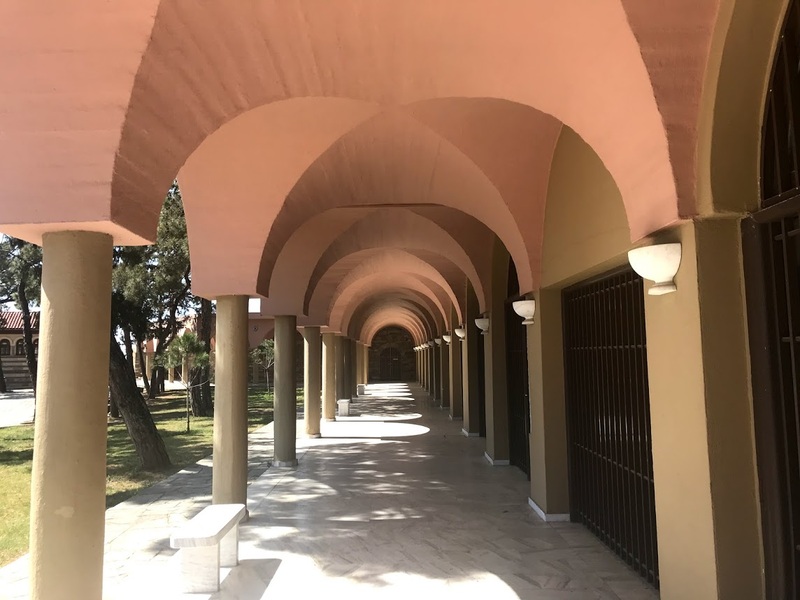 The Patriarchal Institute for Patristic Studies was established in the monastery in 1965 and it has worked closely with the Aristotelean University of Thessaloniki. Restoration work in 1980s revealed wall paintings in the katholokin that date back to the eleventh century. Today, the monastery is a Unesco World Heritage Site, and it is the only remaining, functioning Byzantine monastery in Thessaloniki. The gardens are beginning to bloom and this ‘Balcony of Thessaloniki’ overlooking the city and the sea and across to Mount Olympus offered a quiet and calm atmosphere yesterday after the busy days of Holy Week Good Friday and Easter. The gardens of Vlatadon are also known for their peacocks – which seems appropriate as peacocks are often used in Byzantine mosaics as symbols of the Resurrection. People strolled in and out of the monastery gardens in small groups throughout the afternoon, valuing the quiet, contemplative moments. 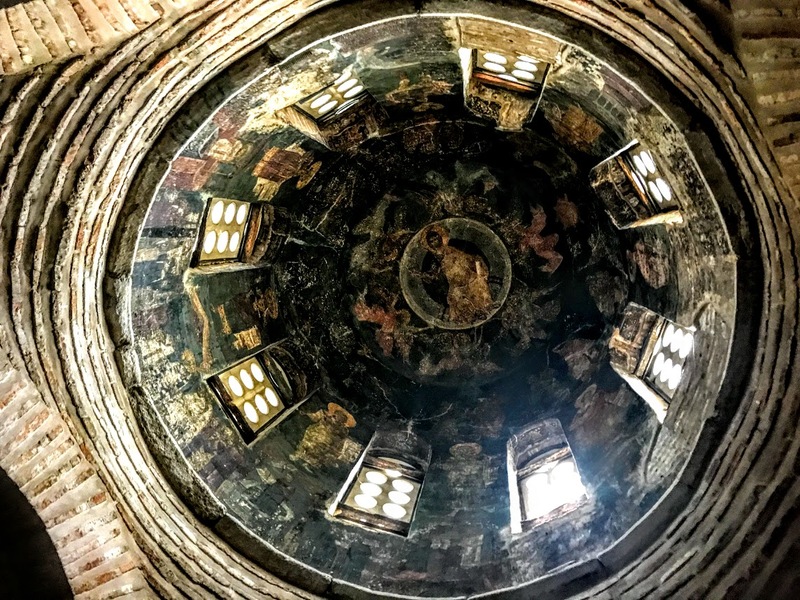 And – like every other church in Thessaloniki – the katholikon was closed. Although many of the churches were converted into mosques in the Ottoman period, those that survived returned to their original use as churches in the 1910s and 1920s, and they often dominate the streetscape. 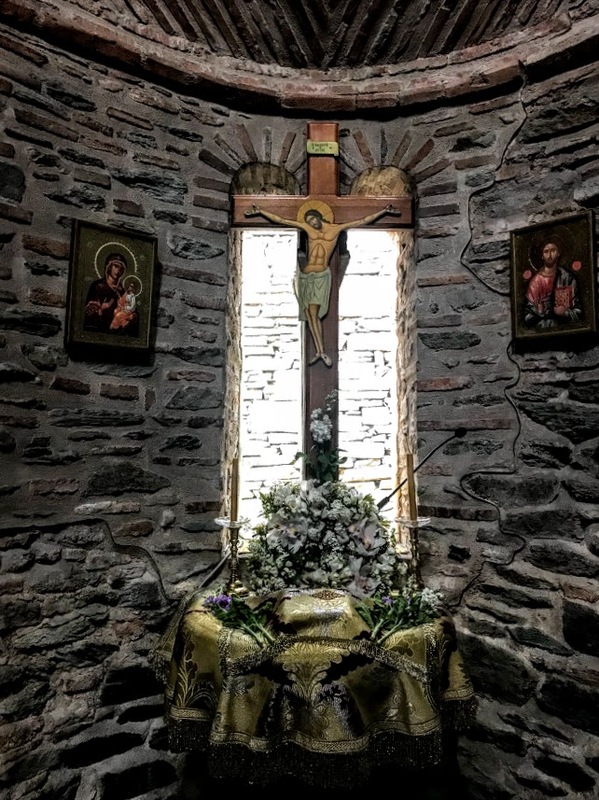 However, one church that never became a mosque and that is easy to pass unnoticed because of its location is the 14th century Church of the Metamorphosis tou Sotíros (Μεταμορφώσεως του Σωτήρος, the Transfiguration of the Saviour), also known as the Church of the Saviour (Ναός του Σωτήρος). 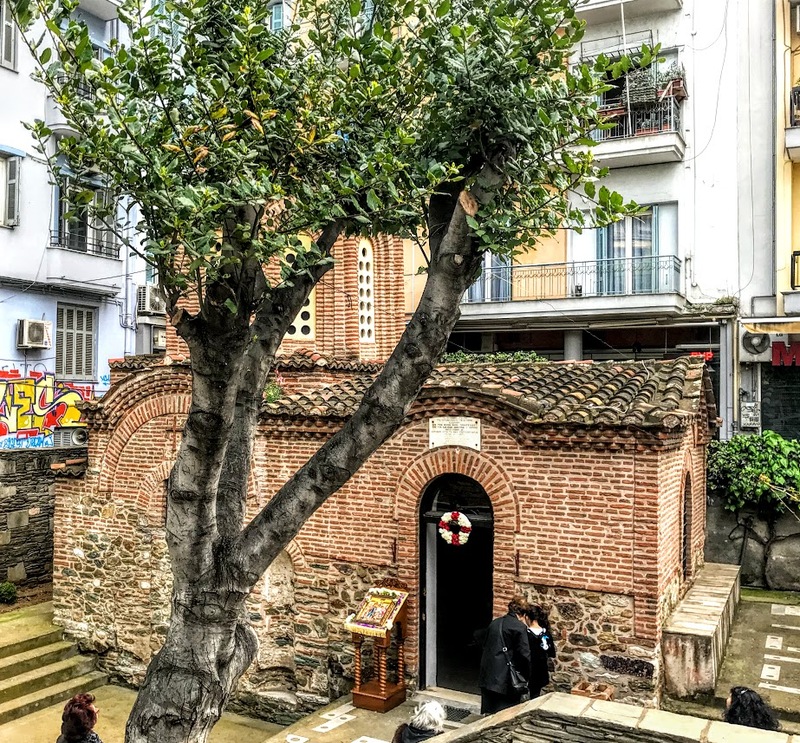 This 14th century Byzantine church is also a UNESCO World Heritage Site as one of the ancient Christian and Byzantine monuments in Thessaloniki. It stands across the street from the Arch of Galerius, at the junction of Egnatia Street and Palaion Patron Street, between the church of Panagia Gorgoepikoos and the Church of Ipapantis. Yet this charming little Byzantine church, despite its tall cupola and its unique and rare architectural features, is often missed by passers-by because it is half-hidden below the current street level of Egnatia Street and is suffocated by the apartment blocks that tower above it and all around it. A coin found mounted in the dome of the church indicates it was built around 1340-1350. Some tombs found under the floor of the north and south arch, under the narthex, and in the area around the building, lead archaeologists to conclude that the church was originally as a sepulchral chapel for a Byzantine monastery. A small reliquary marking the consecration of the church after it was built and two other inscriptions show that the church was first named in honour of the Panaghia, the Virgin Mary. In its original form, this was a square church with a dome, but an earlier, though not Byzantine, narthex at the west end of the church was demolished in 1936 to add the later narthex. The church has a a square floor plan, with four semi-circular niches, one of which forms the arch into the Sanctuary area, and there is no icon screen to mark this division as in other Greek churches. The church has a large and high octagonal dome that is decorated with successive arches and brick semi-columns. The walls are made of raw clay stones at the base and bricks in the upper section. The walls inside were decorated in 1350-1370, and this decorative work is part of the Palaeologan tradition. The frescoes in the dome have been dated to the same period, between 1350 and 1370. The frescoes in the dome are unusual for their depiction of the of the earthly Divine Liturgy as it evolves in the church. The Ascension of Christ is at the top of the dome, and in the levels below are the Virgin Mary (the Panaghia) with the Apostles, accompanied by depictions of the sun, moon and winds. Eight prophets can be seen between the windows of the dome, while at the base there is a depiction of the Divine Liturgy with bishops, deacons, cantors, and lay people. The church was never transformed into a mosque during the Turkish presence in Thessaloniki. Perhaps it was too small for use as a mosque, perhaps it was saved because it stood in yard of a house in the Christian district of Panagouda. The church survived the great fire that raged through Thessaloniki in 1917. But 40 years ago, the great earthquake in 1978 caused significant damage to the church, and the tower with its cupola still seems to lean to one side even after extensive repairs. 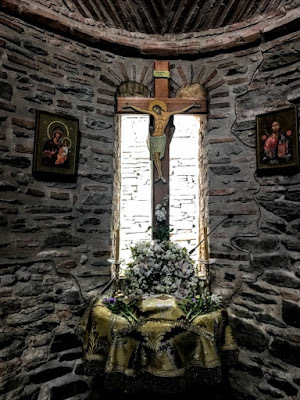 Despite its half-hidden place below street level on Egnatia Street, this church was busy throughout the weekend on Great or Good Friday, Holy Saturday and Easter night.